This is a great parking option if you're heading away for longer trips. Just a short walk from the terminal, it offers a fast and efficient parking service. Birmingham Airport Car Park 5 also offers a reliable transfer service if you're carrying heavy luggage or don't quite fancy the walk. 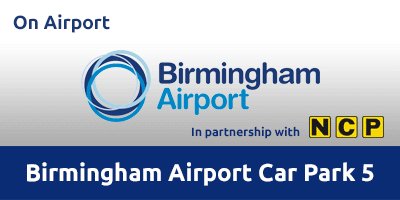 Birmingham Airport Car Park 5 is only a short 10 minute walk from the terminal building. However, if you’d like to use the transfer bus it operates 24 hours a day and runs every 5-10 minutes, taking only five minutes to reach the terminal building. Car Park 5 features CCTV and 24-hour staff so you can relax knowing that your car is being well looked after. The car park is also a holder of the Park Mark Safer Parking Award. This car park has limited spaces for Blue Badge holders, please press the intercom button on arrival for further details. Car Park 5 operates all year round, day and night. This car park does not accept vans, minibuses, motor homes, caravans and trailers. Pick up signs for the airport. On arrival to the airport, follow signs to Car Park 5. Automatic Number Plate Recognition will recognise your car. Take the ticket and the barrier will rise. Park in an available space. Walk or take the transfer bus to the terminal building. If you are not issued with a ticket, press the intercom button for assistance. Collect your car and head to the exit barrier. Insert your ticket for your booking to be validated. Your booking will be checked automatically and the barrier will lift.